This whimsical blanket can be made with selected colors or with scraps on hand for a nice stash busting project. The example has a cream color for the non-“eye” sections, but these can also be made with any number of colors. The example is made in aran weight yarn. Size: Directions are given for three widths. The beginning chain should be a multiple of 60 plus 2. There is a also a chart available. Row 1: Begin in a non-“eye” color. Skip first 3 ch (counts as first dc), dc in 4th ch from hook, dc in each ch to end of row. Turn. Row 2: Make all stitches in both loops. Ch3, dc in second dc, dc in each dc to end of row. Dc in top turning chain. Turn. Row 3: Repeat row 2. Row 4: Ch4 (counts as first tr), tr in 2nd dc, tr in each of next six dc, dc in each of next two dc, hdc in each of next two dc, sc in each of next six dc, hdc in each of the next two dc, dc in each of next two dc, ** tr in each of next 46 dc, dc in each of next two dc, hdc in each of next two dc, sc in each of next six dc, hdc in each of the next two dc, dc in each of next two dc. Repeat from ** across to last 38 dc, tr in each of the next 37 dc, tr in the top turning chain. Change to an “eye” color. Turn. Row 5: Ch1, sc in first tr, sc in each of the next 37 tr, hdc in each of next two dc, dc in each of next two hdc, tr in each of next six sc, dc in each of the next two hdc, hdc in each of next two dc, ** sc in each of next 46 tr, hdc in each of next two dc, dc in each of next two hdc, tr in each of next six sc, dc in each of the next two hdc, hdc in each of next two dc. Repeat from ** across to last 8 tr, sc in each of the next 7 tr, sc in the top turning chain. Turn. Row 6: Ch1, sc in first sc, sc in each of the next 7 sc, hdc in each of next two hdc, dc in each of next two dc, tr in each of next six tr, dc in each of the next two dc, hdc in each of next two hdc, ** sc in each of next 46 sc, hdc in each of next two hdc, dc in each of next two dc, tr in each of next six tr, dc in each of the next two dc, hdc in each of next two hdc. Repeat from ** across to last 38 sc, sc in each of the next 38 sc. Change to a non-“eye” color. Turn. Row 7: Ch4 (counts as first tr), tr in 2nd sc, tr in each of next 36 sc, dc in each of next two hdc, hdc in each of next two dc, sc in each of next six tr, hdc in each of the next two dc, dc in each of next two hdc, ** tr in each of next 46 sc, dc in each of next two hdc, hdc in each of next two dc, sc in each of next six tr, hdc in each of the next two dc, dc in each of next two hdc. Repeat from ** across to last 8 sc, tr in each of the next 8 sc. Turn. Row 8: Ch3, dc in second tr, dc in each stitch to end of row. Dc in top turning chain. Turn. Rows 9 and 10: Repeat row 2 for each. Repeat rows 4 through 10 until afghan is desired length. Fasten off and weave in ends. Note about color changes: The best way to make a color change is to finish all but the very last pull through of the two loops of the last stitch of a row. Cut yarn with a few inches of tail and join with new color next to stitch. Pull new color through last two loops. Weave in ends. 1/24/2014 – Clarified instructions for rows 9 and 10. 2/9/14 – Corrected beginning chain, size and yarn requirements for Extra Large Size. Once again you have come up with the most amazing pattern! Love this…I think I will try it in Black with Neon colored “eyes”. This is a definite one to make for my daughter. She’s marrying on Halloween, and she asked for an afghan for the living room in either wedding colors, or in woods colors. I think Black with orange, yellow, purple and green eyes. lol The brighter the better! Thanks so much for sharing your pattern! So I am ready to start this project and I am reading the pattern and it says there are directions for three sizes. It gives me the beginning number of chains for each size, but how do I adjust the “eye” rows. Maybe I am missing something. It just seems like the directions are for the smallest size and I would like to make the large size. Help! The directions work for all the sizes. The larger the blanket the more “eyes” it will have since they are repeated across the row. 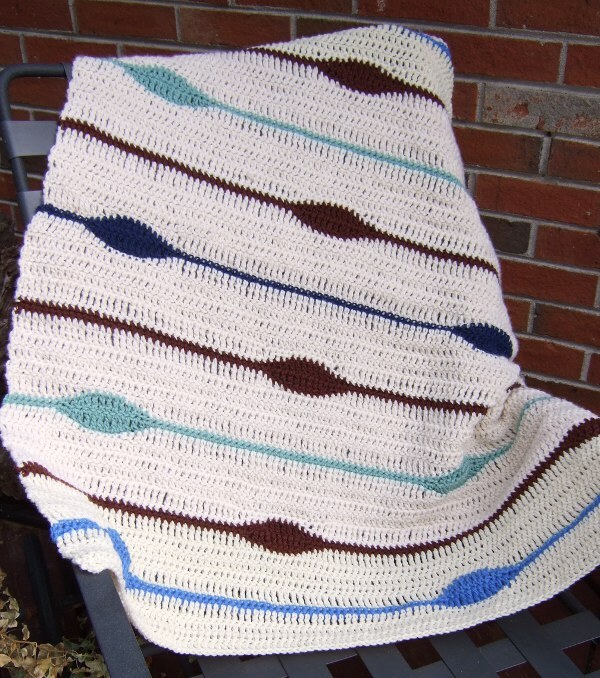 This is a beautiful and easy afghan to make for any occasion. I’m really excited to use this pattern for a new niece/nephew joining the family soon! Just wanted to clarify as I’m reading over this pattern. It looks like the ‘eye’ rows have 2 (for a baby blanket size) eyes every row offset from each other rather than how the picture shows 2 eyes, 1 eye, 2 eyes, etc. Am I reading it right? Each of the eye rows has two eyes. Since the repeated lines are an odd number of lines, every other set of eye rows will come from the opposite direction on the blanket, which is what makes the eyes stagger back and forth up the blanket. Just started this amazing blanket pattern for my 12 year old son and he is beyond excited. I am using a size M hook though and White Bernat Baby Blanket Yarn (Super Bulky) with a royal blue (Bernat Softee Chunky) and Pittsburgh Yellow (Hometown USA) for the eyes. I am using the smallest pattern but since I am using a big hook and fat yarn the width is 68 inches approximately. THANK YOU so much for this pattern. Any tips or hints that you think I might need because of the changes I made? I am thinking it should be just fine, but I may have overlooked something. It should work great. I know that is going to turn out so well. Thanks I’m excited, I’m only on row 4 so far but it works up fast. I got a bit confused on the end of row 4, where it says:”Repeat from ** across to last 38 dc, tr in each of the next 37 dc, tr in the top turning chain. Change to an “eye” color. Turn.” Does that basically mean I tr the rest of that row. That is how I read it but I wasn’t 100% sure. I will post pictures when I’m done on Raverlry. across the row until you reach the last 38 dc, then complete the row with tr stitches. How many eye rows would you say the medium and large sizes have? Based on the picture I see 9 but not 100% sure if that was a medium size or not. Thanks in advance. The example I have in the picture is lap blanket sized, so 39″ long, and yet it has 9 eye rows. A 51″ length would have 12 eye rows. A 76.5″ length would have 18 eye rows. A 95″ length would have 23 eyes. I just started making this for my dad in a bunch of fall colors. This is a great pattern and works up quick. Thank you so much!!! I want to make this extra large in wool and felt it slightly. I think it will have a look and feel of an old Navaho rug or blanket. I have some homespun suffolk yarn that will work beautifully. Thanks for the inspiration! The row 4-10 repeat is an odd number of rows (7) so every other repeat will be on the reverse side as the prior repeat. This will cause the eyes to stagger although you repeat the same rows. If yours truly aren’t going to stagger, make sure you have the correct number of rows. Just started on row 4 and I’m short on my ending 37 stitches shouldn’t the beginning chain be 240??? I”m making the xlg size I can make the 4th eye but I’m short for my 38 stitches for the end..
You are absolutely correct. I had an error in my spreadsheet that I use to make the sizes and chart. The beginning chain for the extra large size should be 242. I am so very sorry about that error and the work you’ve done with the wrong beginning chain. I changed the pattern for the correct beginning chain. I also changed the size and yarn requirements. Thanks for this pattern! I enjoyed making it. I used a variegated yarn in place of the white and added a pomp a doodle trim. I had the same difficulty as Lori above but now look forward to starting the project again. Love the pattern. I’m a novice at crocheting. I’m following the patternn and the eyes are coming out in the same place each time, rather than in a different spot like the picture shows. How do I move the eyes to the middle on the alternating repeats? The pattern repeats rows 2 to 10 which is 9 rows. Make sure you are counting your rows this way. The odd number of rows will cause the rows to be made starting on the opposite end every other time. Love, love, love this pattern. Quick question. Is the yardage mainly for the dominant color? I’m going to make the large pattern, and I want to make sure I get enough yarn. The yardage is in total. Roughly 80% is in the main color. Hello, thank you so much for supplying this beautiful crochet pattern. It’s absolutely beautiful & perfect for my best friend!! I have one problem though, I have difficulty reading patterns & am wondering if by chance you have this drawn up in a graph?? Looking so forward to being able to crochet this awesome pattern. Thank you for this pattern. I was looking for something different to make for a new great niece that on the way and I can’t wait to make this. In getting ready to start this project and reading through the pattern and the comments, I have gotten confused. At the end of the pattern you say ” Repeat rows 4 to 10″. But, in the February 1, 2015 response to Ronnie you say “The pattern repeats rows 2 to 10 which is 9 rows.” Please clarify which repeat should be worked. I’m sorry about that confusing comment that is inconsistent with the pattern. The pattern is correct and I misspoke in the comment. The point I was making in the comment was that this is a repeat of an odd number of rows which is what creates the alternating location of the “eyes”. That pattern is correct that the repeat is the 7 rows of row 4 to 10. Just wondering as I am new to crocheting and have been trying this pattern do you have 122 in each row, I seem to have gap/ holes near each end but don’t seem to have enough chains in row 4 I seem to have 37 not 38. Is there a video off this pattern. I just love the look. Two of the chains of the beginning chain are used for the first stitch, so you should have 120 stitches per row. This includes the turning chains at the end of the rows which are treated like stitches. I don’t have a video for this one.